The Brown Girl Diaries: It's My Story and I Am Sticking To It! It's My Story and I Am Sticking To It! I am so glad to see the beginning of December, primarily because November was a month full of ups and downs, highs and lows. I started out the month on a quest to blog daily, but quickly lost traction with changes at work, changes at home, and changes within the family. On the positive side of things, I embarked on new ventures with outstanding people and began laying the groundwork for even greater things to happen in 2014. On Thanksgiving Day, after an emotionally gut-wrenching talk with my mother, I arrived back home to have the most open and honest conversation with my Maker that I have had in a very long time. During those moments of crying out to God, I saw my life flash before my eyes and began to understand myself and my journey in ways that I hadn't understood it in the past. You see, I am a 47-year-old, childless, never-married, multiple degree-having sister who has spent most of my adult life searching: for the right career, the right man, the right friends, the right lifestyle and the right place to call home. Like the quote at the top of the page suggests, my story has often felt like a combination war story/horror story/comedy of errors, so I just had to ask, "Why?" Truthfully speaking, the response that I got shook me to the core, because I began to realize that, like the Scarecrow, the Tin Man and the Cowardly Lion in "The Wiz," I've had what I've been searching for inside of me all along. Like many of the people walking this earth, I rejected the story-crafting power bestowed upon me as the co-creator of my own life journey and allowed circumstances, situations and people to send me down pathways that were never intended to lead me on a peaceful journey towards "home." Knowing what I know now, I am ready to begin a new chapter of my life and write a story that goes a little something like this: The heroine of the story is a happy, healthy and whole woman who travels the globe engaging in work that feels like play; spends quality time with her soul mate, family members and a close-knit band of brothers and sisters; stays connected to her Creator and her community; and lives her life like it's platinum! 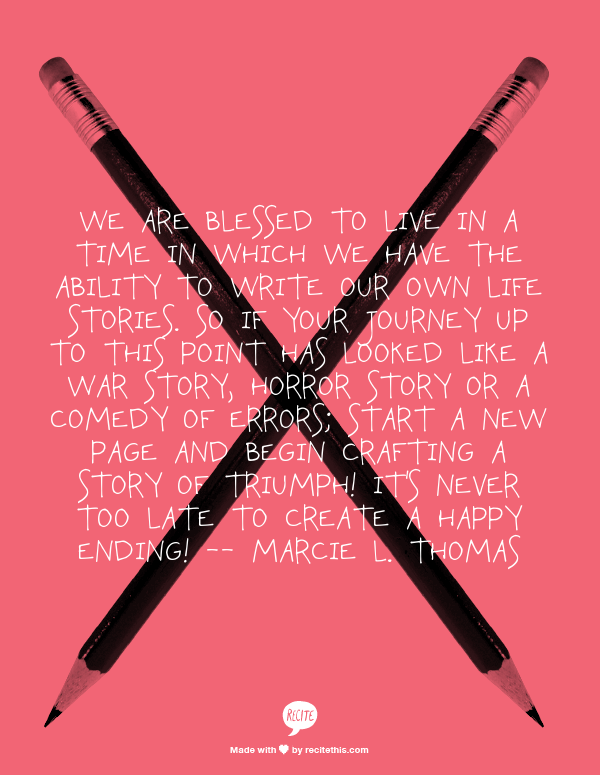 Question: Given the opportunity to write the next chapter of your life, what would it look like? What steps can you start taking today to turn fiction into fact? Thanks for sharing your story. I understand all too well the zeal of wanting to post every day and then falling short when life shifts priorities. To answer your question, I'm writing the next chapter of my life now. Ironically it begins with blogging/writing every day in preparation for living a writer's life. Same here, Aminah! Here's to success for both of us!